Prior to Saturday night’s Los Angeles Kings and Vancouver Canucks face-off, AEG, the Kings, STAPLES Center, and Toshiba held a ribbon-cutting event to commemorate the opening of the venue’s new fan destination, LA Interactive powered by Toshiba. 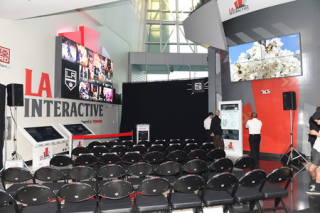 LA Interactive powered by Toshiba – located on the main concourse of STAPLES Center – is meant to enhance the fan experience with exclusive interactive content, social media visualizations, live game action, player stats, game scores, out of town action and more. As part of the launch Saturday evening, Luc Robitaille, president of business operations for the Los Angeles Kings; Lee Zeidman, president of STAPLES Center and Scott Maccabe, president, and CEO of Toshiba America Business Solutions, Inc. all touched upon their continuing commitment to offering best-in-class experiences for their respective consumers. The space features Toshiba technology including a 6-by-13 foot LED video wall, an 8-by-5 foot Toshiba Ultra HD video wall, two 46-inch Toshiba Virtuoso interactive touch displays featuring team and event-specific information, a 60-inch Toshiba “Touch & Get” interactive kiosk allowing for high-speed transfers of exclusive Los Angeles Kings and STAPLES Center content, and three 65-inch Toshiba Ultra HD displays. “On the heels of our second Stanley Cup Championship in three years, we have a more committed and energized fan base than ever, and bringing those fans together in person is something that I am particularly proud of going into this next season,” said Robitaille.